In 1674 most people who had a chimney in their home were due to pay a tax to the Crown. 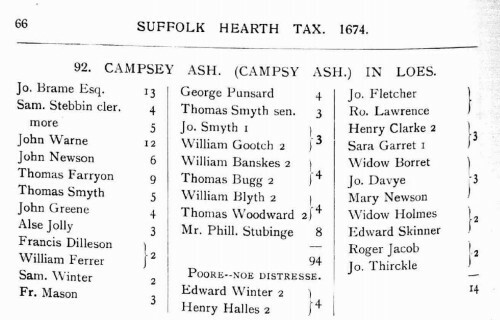 The record for Campsea Ashe gives an indication of who lived in the village at this time and so can be seen as an early for of census for the village. The record below wasz transcribed in 1905 from the original by George Booth.The numbers by each resident indicate the number of hearthas in the house.